The Syrian government and rebel groups have agreed a nationwide ceasefire from midnight (22:00 GMT) on Thursday. The deal was announced by Russia's President Vladimir Putin and confirmed by Turkey. The two nations, which back opposing sides, will act as guarantors. The High Negotiations Committee (HNC), regarded by the UN as Syria's main opposition body, confirmed the deal, which excludes jihadist groups. If the truce holds, peace talks will be held in Kazakhstan within a month. At least 300,000 people are believed to have been killed in fighting that followed the uprising against President Bashar al-Assad in March 2011. A further four million have fled the country to seek refuge in neighbouring states or Europe. On the one side, Syrian government forces, their factional allies and the Russian military. On the other, the Free Syrian Army (FSA), a loose alliance of several moderate rebel factions, plus other groups under the High Negotiations Committee (HNC), the umbrella group representing Syria's political and armed opposition factions. FSA spokesman Osama Abu Zaid said there were 13 armed opposition factions in all who had signed up. The Russian defence ministry listed seven of the main rebel groups included in the truce as Faylaq al-Sham; Ahrar al-Sham; Jaysh al-Islam; Thuwwar Ahl al-Sham; Jaysh al-Mujahidin; Jaysh Idlib and al-Jabhah al-Shamiyah. Ahrar al-Sham and Jaysh al-Islam (Army of Islam) are the key names, neither of them part of the FSA. Jihadists. So-called Islamic State (IS) "and the groups affiliated to them" are not part of the agreement, Syria's army confirmed. It also said Jabhat Fateh al-Sham (formerly the Nusra Front) was excluded. However, some rebel officials told Reuters it was part of the deal, giving a hint of the complications that lie ahead. This is because JFS is intrinsically linked in Idlib province to groups that have signed up to the truce. Image caption How will the Kurdish YPG react? The FSA also said that the deal did not include the Kurdish Popular Protection Units (YPG). The YPG, along with other Kurdish militias, controls a large area of northern Syria up the Turkish border. It is regarded by Turkey as a terrorist organisation and an extension of the banned Kurdistan Workers' Party (PKK). What are the terms and where does it cover? It is nominally nationwide, although that really only covers the areas where the sides who have signed up to the truce have a presence. Looking at the map, there are large swathes under both jihadist and Kurdish control. One area that is included is the rebel-held area of Ghouta in eastern Damascus, where government forces have been advancing in recent months. Under the terms of the deal, the peace talks would begin within a month of the ceasefire taking effect - and holding - and would be held in the capital of Kazakhstan, Astana. The Kurdish YPG would not take part in the peace talks, the FSA said. How did the ceasefire come about and can it hold? Previous ceasefire initiatives this year brokered by the UN, or the US acting with Russia, quickly collapsed. But earlier this month, Russia and Turkey negotiated a ceasefire in Syria's second city, Aleppo, that led to tens of thousands of rebel fighters and civilians being evacuated from an enclave besieged by government forces. The fact that the rebels have been losing ground may help this truce. The HNC admitted on Thursday that, because of the rebels' limited resources against government forces and their allies, it was "not possible to continue" the fight. What has the reaction to the deal been? Mr Putin himself described the deal as "fragile". He said Russia would cut its military presence in Syria but made it clear Moscow would "continue fighting international terrorism and supporting the Syrian government". Syrian Foreign Minister Walid Muallem said there was now a "real chance of finding a political solution" but that the rebels taking part must distance themselves from IS and former al-Qaeda fighters. Turkish President Recep Tayyip Erdogan said a "window of opportunity" had been created that "should not be wasted". He vowed to continue fighting IS and "terrorist groups". Difficulties lie ahead in peace talks. Turkey has already called for the Lebanese Hezbollah movement - linked to Syria's ally Iran - to leave Syrian soil, which is sure to cause problems. UN envoy for Syria, Staffan de Mistura, welcomed the new deal, saying he hoped it would save lives and improve aid delivery. "These developments should contribute to inclusive and productive intra-Syrian negotiations to be convened under UN auspices on 8 February," he said. The US state department said the deal was a "positive development" which it hoped would be "implemented and fully respected by all parties". One rebel commander told Reuters: "This time I have confidence in its seriousness. There is new international input." 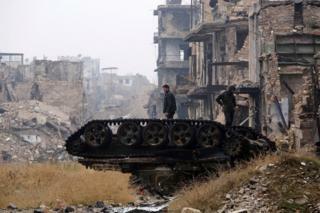 The FSA said it would abide by the truce but would retaliate against violations by government forces and their allies. The FSA's Osama Abu Zaid said it had so far had no direct talks with the Syrian government and still insisted that President Assad would have no place in the future of Syria.